TKUBE is a web-based Translation Management System offering full customer and employee support including translation project tracking, online ordering, online payment, and online accounting. TKUBE significantly reduces translation management time and cost; everything is automated from customer registration, to pricing, invoicing, purchasing, payment, tracking, customer support, translators’ selection, project distribution, and project accounting. You can also check out TKUBE in action at grouptt.tkube.com or contact us if you need more info about a specific section or feature. Users in the TKUBE are of different types. Each type of users in the TKUBE has a user-specific role, features and limits. Within the environment of a company, different employees have different privileges and access rules to different functions and departments. The same is applied in the TKUBE with one addition: Your customer gets to be part of your company too. Each user in the TKUBE has a profile. Depending on the type of user, the profile contains data on the user that range from simple contact information to more complex specific professional information such as translation or professional skills, preferences and experience, in addition to his/her functions in the system. The Profile Management system allows complete search and access to relevant information on the users in the system. Communication is essential in every company. Clients want to speak with their project managers and the management needs to be able to speak with any user in the system. Some users should not be able to communicate with each other and some messages need to be sent to multiple receivers. All that is regulated in the Internal Messaging System, which goes further so as to offer the user the option of getting the message and its replies automatically sent to his/her e-mail account too. Users as well as non-users can open a Support Ticket. The support ticket is directly received by the relevant department. Tickets can be opened, replied to and closed. All users in the relevant department receive the ticket; once one of them replies to it, the ticket status is updated so the other users in the relevant department are informed. 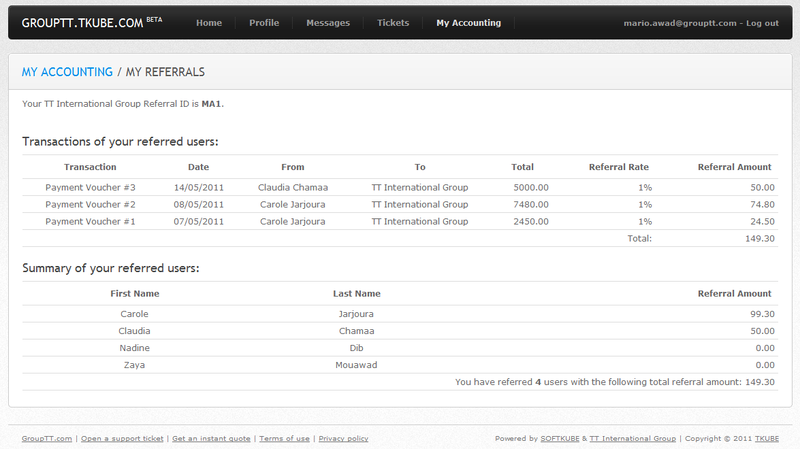 TKUBE includes a complete basic accounting system with a specific type of users to run it (i.e. an accountant). Every user in the system has a balance and can pay the company or receive money from it. 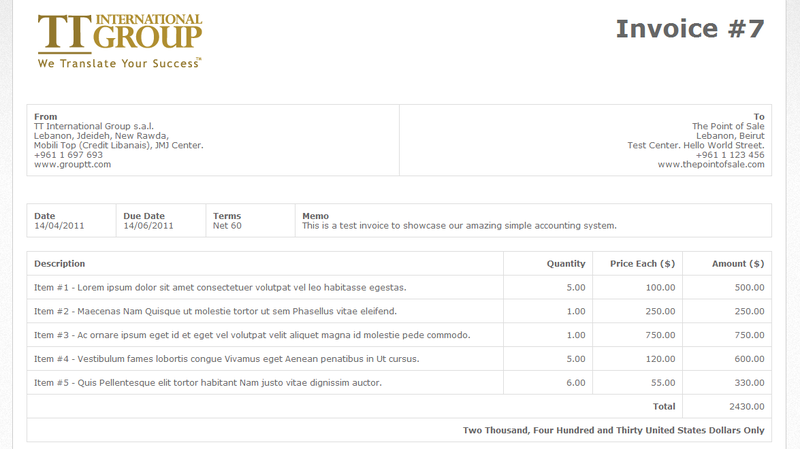 Estimates, Invoices, Receipt Vouchers, Purchase Orders and Payment Vouchers can be made and sent to the users. 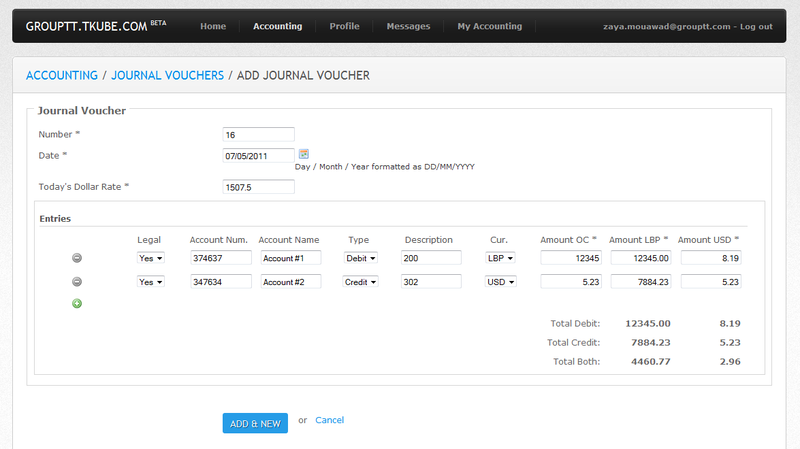 The Accountant also has a Journal Voucher application that calculates total of debit and credit transactions based on a specified (or default) exchange rate of USD and LBP. Every user in the system has a referral code that can be used by clients or employees while registering in the system or placing an order with the company. If the referred user were a client, he gets a discount on orders and his referrer gets a percentage of the amount he pays the company; if the referred user were an employee, his referrer gets a percentage of the amounts he gets from the company. When a user places an order with the company, a project management page containing information about the project is created. 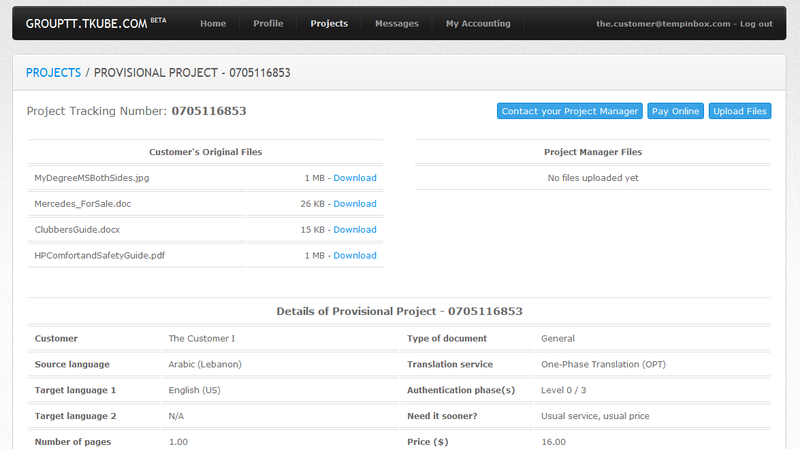 This page contains a link to pay online, a link to contact your project manager, and a link to upload/download. 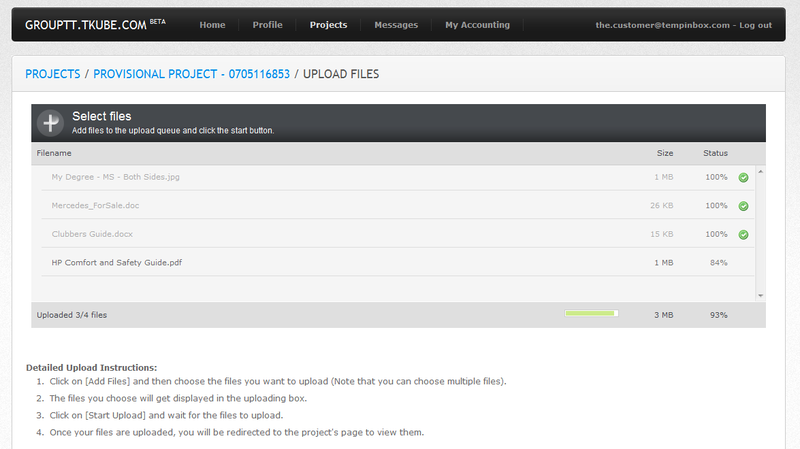 Both the client and the project manager can upload and download different types of documents. This same page can be used to track the progress of the order as well as the status of every phase, its starting and ending date. Based on specific variables provided by the company, the Smart Estimator can automatically give a user a provisional quotation for his/her translation project, including price and delivery date. The user can then either place an order and wait for confirmation by a Project Manager or Request a Quotation. In both cases, the user will be directed towards signing in or registering in the TKUBE and will automatically be assigned a provisional project panel where s/he can upload his/her documents or pay for the translation order. Users can choose to enable or disable receiving notifications to their e-mail addresses. TKUBE is built upon SOFTKUBE’s innovative technology and using the latest, most advanced, and widely adopted open-source languages and frameworks. SOFTKUBE’s technology is analytics-enabled and eases reports generation regarding users and which sections of TKUBE they use the most. This information is essential for TKUBE’s continuous improvement. In more details, TKUBE uses SKL, SOFTKUBE’s Library for building advanced web 2.0 applications. SKL in turn is based on PHP, Linux, MySQL, Apache, Zend Framework, and jQuery; the same open-source technologies used by major players in the tech industry like Facebook, Wikipedia, Flickr, and WordPress.